Hammered Out Bits: Early Iron 4 - Event Details! Early Iron 4 - Event Details! 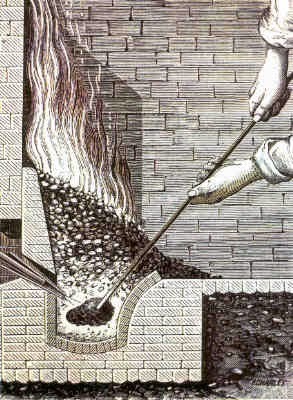 Many contemporary Blacksmiths had pondered the question of just how our metal was made. Almost two decades ago, a few had turned that interest into the first attempts to build ancient and historic iron smelting furnaces, working from hints in often broken traditions and fragmentary archaeological remains. In 2004, Mike McCarthy boldly hosted the first Early Iron Symposium, gathering together people who had previously been working only in isolation. This first event was centered on demonstrations of experimental furnaces based on differing historic systems inspired by European, African and Japanese traditions, by Lee Sauder & Skip Williams, Darrell Markewitz and Mike McCarthy. Following the success of EI 1 came two more annual events, more centered on teaching effective method than pure experimentation. The result of much trial and many errors had lead to the development of simple but more predictable working methods. Those who had kindled that spark then would see it flame and grow. Over the last decade since the last Early Iron in 2005, there has been an explosion of interest in bloomery iron as a material, especially within the Bladesmithing community. It might to be fair to say there is a 'new generation' of talented metalsmiths exploring the possibilities of bloomery iron. There still remains, however, many questions to answer, technical problems to solve, and mysteries to uncover. Early Iron 4 will be turning back to some of those experiments, highlighting the continuing efforts to figure out 'just how it might have been done'. Lee Sauder, certainly the oldest and best known worker with direct process bloomery furnaces in North America, will build and fire an experimental furnace based on the medieval Spanish Catalan type, assisted by 'Early Iron' instigator Mike McCarthy. Jesus Hernandez, one of the top bladesmiths making and using bloomery iron in the USA, will bring his understanding of the Catalan as well as share his extensive experience with 'bloom to blade'. Darrell Markewitz will continue his long investigations into Viking Age ironmaking technologies. Early Iron 4 will not just allow participants to observe, participate and learn. Perhaps most importantly, it represents a chance to gather individuals from all aspects of the riddle of Early Iron, face to face. So many of us work alone, often with little ability for advice on common problems or to share our excited discoveries. It remains our hope that Early Iron 4 will pull together the researcher, experimenter and practical worker - to the enrichment of us all. If there was a single person who could be said to have initiated the current 'Early Iron' movement, that person would certainly be Lee Sauder. Assisted by his smelting partner Skip Williams, Lee undertook his first experimental bloomery iron smelts in 1998. Originally inspired by African protoypes, Lee developed a predictable working method through many trials (and often errors!). His patient and open sharing of all this hard won experience has informed and inspired the current generation of bloomery iron makers. As well as hosting the series of Smeltfest research events at his own 'Germinal Ironworks' (Lexington, Virginia), Lee has demonstrated at major events internationally throughout North America, in Europe, and in Africa. Lee will lead a team through two experimental attempts at smelting in the "Catalan" style furnace. The furnace features a square hearth, with a divided charge of charcoal and fine ore on the tuyere side, and large ore chunks on the other. 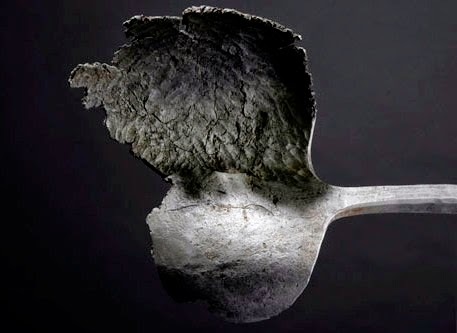 This (loosely Medieval) Spanish technology has not been examined by modern practitioners as thoroughly a shaft furnaces, so we all expect to learn a few new things, and maybe get some iron too. All day Friday and all day Saturday. Lee will also give an informal presentation on his recent excursion to the Meroe Iron Smelting Festival in Sudan. This was Lee's second participation in large gatherings of iron makers in Africa. The first was at the the Festival Wed Binde, Burkina Faso in 2008. Born in Spain, Jesus did not start to exploit his life long interest in historic blade making until he emmigrated to the USA in the 1990's. His work is strongly rooted in the Japanese traditions, where his attention to fine detail and precision of technique lead him to bloomery iron through experimenting with the Tatara system. Of late his vision has shifted back to his native Spain, both in terms of blade prototypes and research into the Catalan furnace. The quality of his bladesmithing is exceptional, clearly making him one of the primary examples of 'bloom to blade'. Jesus has increasingly been seen as a feature demonstrator, from his home base in Roanoak,Virginia. Jesus will be forming part of the team (working with Lee) building and operating the experimental Catalan furnace. Mike's interest in bloomery iron smelting goes back to his work at the Farmer's Museum and his enthusiasm in the philosophy of 'Sole Authourship'. At the start, he had a unique opportunity to attend a workshop with the Japanese 'Living Treasure' Smelt Master in 2003. Mike's original interest was in the early American Adirondack bloomery furnaces. In 2004 he hosted the first Early Iron Symposium, at the Farmer's Museum at Cooperstown NY, followed by another in 2005 and a third at Peter's Valley Craft school in 2006. He has been a core member of the 'Smeltfest' research group since its inception, and has taught any number of hands on workshops and smelting demonstrations. Mike also was the 'other American' at the Festival Wed Binde, Birkino Faso in 2008. Mike will be one of your on site hosts for Early Iron 4. Between these duties, he will be assisting Lee with the two Calatan furnace experiments. Darrell's first attempt at a bloomery furnace was at a research session for Parks Canada in an attempt to re-create the first iron smelt in North America by the Norse (about 1000 AD). 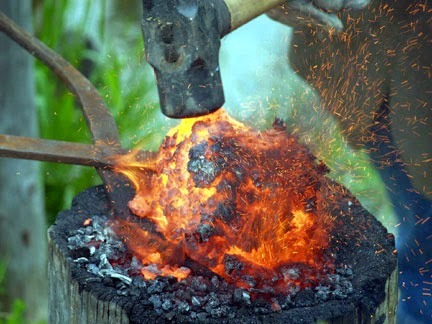 Since then, he has concentrated on re-discovering lost Northern European techniques from the Late Iron Age, using the process of experimental archaeology. Darrell was a team leader for all of the previous Early Iron symposiums, as well as another core member of the Smeltfest research workshops. He has taught historical iron smelting both in Canada and the USA, as well as taking part in research projects in Denmark and Scotland. 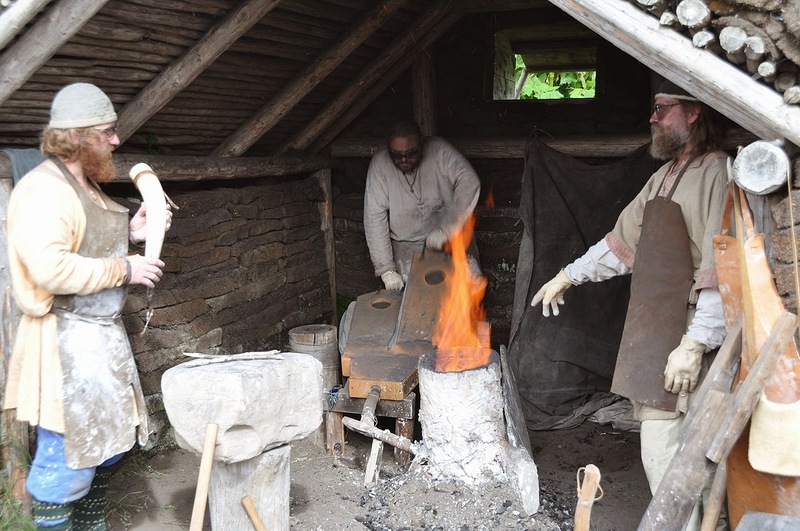 Darrell will be undertaking an experimental archaeology project which also will provide a more basic level furnace construction and operation sequence for less experienced bloomery iron makers. The furnace will be a 'Norse short shaft' type, to be built over the early afternoon on Friday. The smelt on Saturday will employ a 'bog ore analog' and the experiment will centre on using mutliple double chamber bellows linked to a bladder as a possible method to produce high air volumes. Participants actively sought! A tradition for NBA, their 'Iron in the Hat' both offers a chance for you to pick up some useful / unusual items, and also helps fund the entire event. " Each registrant is asked to bring a donated item or items with a value of $10-$20. It can be tools, materials, crafted items, apparel, books, ...anything that appeals to this kind of crowd. We sell 'one chance' tickets, and run it like a silent auction. " Ongoing, draws Saturday, right after lunch. Join the demonstration team for a general discussion around past and possible future exploration into Early Iron. Finish off the event with a little forge time. The demonstration team will be on hand for a little hands on trouble shooting. What problems have arisen with your own work with bloomery iron? Hopefully all our combined brain power might help find some answers. Details on Event schedule / Pricing to come! Early Medieval 'Twin with Bar' Bellows? Antique objects / Bloom iron ?